On Monday, James “Whitey” Bulger (83) was found guilty of taking part in 11 of 19 murders and other racketeering offenses. The verdict sees that the former Irish Boston mob boss is sent to jail for the rest of life. After a clerk checked off the 31 offenses he was found guilty of, Bulger gave his family the thumbs up—only to be heckled by a relative of one of his victims. The guilty verdict puts the crime boss away after he was on the free from 1995 to 2011. He originally fled justice after a corrupt federal agent informed him that the FBI was preparing to drop the hammer on his operation and put him away on RICO charges. He was eventually captured in California after being sighted in several cities around the world. The 11 murder victims Bulger was charged with included Tulsa business man Roger Wheeler, John Callahan, Thomas King, John McIntyre, Paul McGonagle, Edward Connors, Brian Halloran, Richard Castucci, Arthur “Bucky” Barrett, and the strangling death of Deborah Hussey. James Bulger being found not guilty of eight murders left a bitter taste for some of the families of the victims. The deaths of Al Plummer, William O’Brien, Al Notarangeli, James Sousa, Michael Milano, James “Spike” O’Toole, Francis “Buddy” Leonard, and Debra Davis all slipped through federal prosecutors’ grasp and the jury found that there wasn’t enough concrete evidence to say that Bulger had a hand in them. While the judge stated that she wouldn’t reveal the jurors until Friday, one juror, Scott Hotyckey, appeared on local WBZ radio and gave insight on the case. 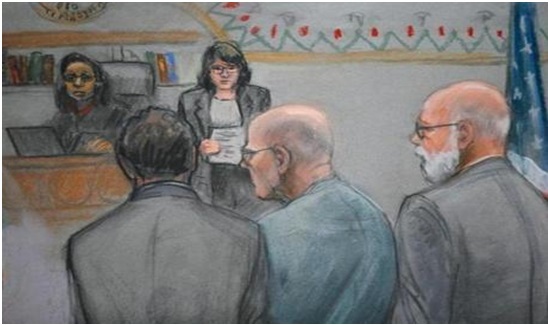 That juror said there was disagreement during the deliberation stage and that roughly five jurors weren’t convinced that Bulger had been proven to have strangled Stephen “The Rifleman” Flemmi’s girlfriend, Debra Davis. One of Francis Leonard’s daughters said “You’ve got to be kidding me,” when the clerk said that his death at the hands of Bulger wasn’t proved. U.S District Judge Denise J. Casper scheduled Bulger’s sentencing to take place over three days November 13-15. She also stated that a day might be set aside for victim impact statements. It should be noted that James “Whitey” Bulger is still in the crosshairs of the law for the 1981 and 1982 murders of Oklahoma and Florida businessmen respectively. In Oklahama, he is charged for killing Roger Wheeler when he declined selling his company, World Jai Alai, to a Boston businessman. That businessman associated with members of the Winter Hill Gang, but wasn’t affiliated with them. He was charged in killing another businessman, John Callahan, in Florida. An FBI informant warned Bulger that Callahan was being sought by the FBI for questioning in Wheeler’s death. Information that Callahan may have provided would have probably implicated the duo of Bulger and Flemmi. Michael Von Zamft, the Miami-Dade Assistant State Attorney, said that Bulger would likely be sentenced to life in Florida. He went on to mention that the state would have to decide if it would be worth trying him or allow for him to “negotiate something.” The thing here is that Bulger wouldn’t have much in his natural life. Piling on more life sentences or death would be more symbolic than actually putting him away and making sure he doesn’t get out. J.W. Carney Jr., a pivotal part of James Bulger’s defense, said that they would be appealing the conviction. Their grounds for appeal will be that they weren’t allowed to state that Jeremiah O’Sullivan, a deceased prosecutor and leader of the New England Organized Crime Strike Force promised immunity from prosecution on all crimes—including murder—decades prior. Judge Denise Casper shot down that notion as Bulger had no actual proof that such a conversation took place or promises were made. She went on to mention that even if the conversation took place, O’Sullivan couldn’t make such a guarantee. That aside, he said that Bulger wasn’t down on the charge since it exposed government corruption. “Mr. Bulger knew as soon as he was arrested that he was going to die behind the walls of a prison or be injected with a chemical that would kill him. This trial was never about Jim Bulger being set free.” Carney said. There was some criticism from legal analysts and observers that the defense team focused too much on trying to prove that Bulger wasn’t an informant. Documents kept by the feds showed otherwise. Even with this evidence, the defense stated that FBI agent John Connolly Jr. was proof that the FBI’s word couldn’t be trusted on that front. Bulger was indicated as an informant from 1975 to 1990. His relationship with the FBI allowed for his Winter Hill Gang to flourish in Boston by having a drop on rivals and law enforcement. By the end of the trial, federal prosecutors had called 63 witnesses which included associates, victims, and families of the victims. The jury sorted over the evidence and recollections and after 32 ½ hours of deliberation found him guilty of several racketeering charges—which are basically miscellaneous organized crime acts—and 11 murders. It was a huge task for the defense to attempt to pull Bulger from the fire on the charges. There were simply too many for them to clear Bulger on all of them and the jury only had to run with two of the 33 racketeering charges.